A person with autism may keep on repeating phrases read from airports’ posters on bomb threat or hijacking; or he may resist passing through metal detectors or being frisked. One critical concern is dealing with security issue when traveling by plane. From the security personnel’s point of view, the behavior of a person or child with autism (PWA/CWA) may make them anxious. Examples: an “echolalic” PWA may keep on repeating phrases read from airports’ posters on bomb threat or hijacking; he may resist passing through metal detectors or being frisked. Tantrums are also magnified when confined inside a plane. Left unexplained, behaviors like those mentioned above may delay their trip and cause anxiety. These are also the types of situations that can easily escalate into verbal and physical confrontations, and maybe even physical containment and restraint. While we continue to advocate for an autism-friendly environment, everything begins at home. 1. PLAN TRAVEL IN ADVANCE, IF POSSIBLE. Call the airlines. Ask what you can do to help the security process go more smoothly for the PWA. If the trip has to be made suddenly, arrive extra early and explain what your CWA’s needs are.Your CWA may need special seating arrangement. ASP National President Grace Adviento realized after her son’s first flight that it is better for them to be seated in the front row. Bored, her son Adrian moved about his seat and accidentally kicked the seat in front of him several times,which disturbed their co-passengers. Other preferences – such as back of the aircraft, near the aisle, window or lavatory can be arranged during the time of ticketing or at least 48 hours in advance. However, seats along emergency exits cannot be given to those who may need assistance in times of emergency. There are airlines that offer assistance program for a fee. The program offers personal assistance through the crucial security checkpoints: from check-in, through security and boarding, and through the destination airport. • Social stories. Make a social stories booklet to help prepare your child for a flight. Review the process with him. Do it over and over for at least two weeks. The Manchester Airport (UK) developed the Airport Awareness program for children with autism. It is a practical guide that can be used for any airport experience. The guide is provided for free at Manchester Airport, but they have also placed the entire guide online for free, and printable. The guide goes step by step from “ways to get to the airport” to “the journey of your suitcase.” It provides checklists such as “Did you see or hear? (“the walk-through metal detectors...the machines beeping”). It also has lots of pictures to accompany each section, and space to write down worries that the young traveler with autism may have. • Desensitization. If your CWA has not traveled on a plane before, or you are going from a new airport, or on a bigger/smaller plane, you may like to bring your CWA to the airport before your flight. This will help your child to understand what the airport is like, as well as allowing him to experience the journey to the airport before you go. You can help desensitize the child by exposing him to the noise of airplanes, or helping him to get used to sitting down with a seat belt fastened. Some airlines/airports are able to organize tours around an aircraft or on a simulator to help people with disabilities. 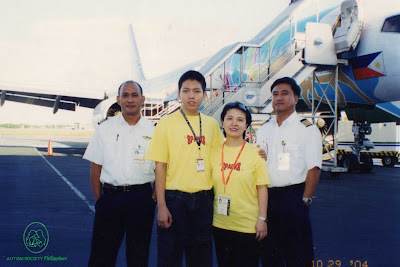 As early as 2004, the Special Partners for Autism on Recreation, Knowledge and Socialization (SPARKS) was able to arrange a fieldtrip with the local airline. SPARKS family members were accommodated on the ground plane complete with orientation from the airlines personnel. formation on autism. Make sure to carry enough copies to leave behind with the airport/airline security personnel you may encounter. ple who look or stare at them when either of her two sons with autism starts behaving differently. Your personalized handout may also include a short description about your child, a photo and some short information. You may also want to include your contacts in case your child is lost. • Medical certificate indicating the child’s specific need for an appliance may help explain to a ground crew or flight attendant the specific need better. 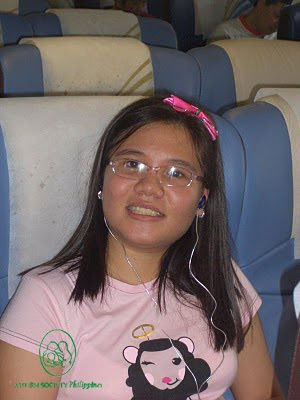 ASP’s board trustee and Metro South Chapter President Evert Malapad’s daughter had to wear earphones to protect her from the noise of the plane. The flight attendant allowed her to keep the headset provided the music was turned off. They had a medical certificate signifying her need for the device due to her autism and sensory problems. 4. BRING YOUR CHILD’S INDIVIDUALIZED BAON. Each CWA has his own unique needs. Let us not assume the airlines can provide all of them. Better over-prepared than sorry. • Carry-on appliance, such as ear muffs or ear plugs to help with sensory issues. • Medication, if your child is under medication, be sure to bring it along the plane ride together with the doctor’s prescription. Some doctors, when necessary, may prescribe your child with something to help him calm down. • Chewing gum or candy that may help ease pains on the ears during take-off and landing. • Special diet, like gluten-free casein-free diet (or GFCF diet) popular among families dealing with autism, but which may not be offered by any airline. • Additional food or snacks to pass the time. • Depending on the CWA’s interests, maybe toys, video games, crayons, coloring book, Legos, PlayDough, DVD. Putting on seat belts, locking our back doors, paying the life insurance are common sense options associated with everyday life. Taking extra precautions is also an everyday consideration that parents of CWA should also become accustomed to. …. These can help make our family trips safer and more relaxing. Happy trip! Autism Society Philippines conducts orientation on understanding autism to make community integration easier for Filipinos with autism. This includes handling customers with autism for commercial establishments like SM Malls, Robinsons Malls, Ayala Malls and Cebu Pacific Airlines. For details, visit www.autismsocietyph.org.